The LHC was funded internationally and built in collaboration with over two thousand physicists from thirty-four countries, universities and laboratories. 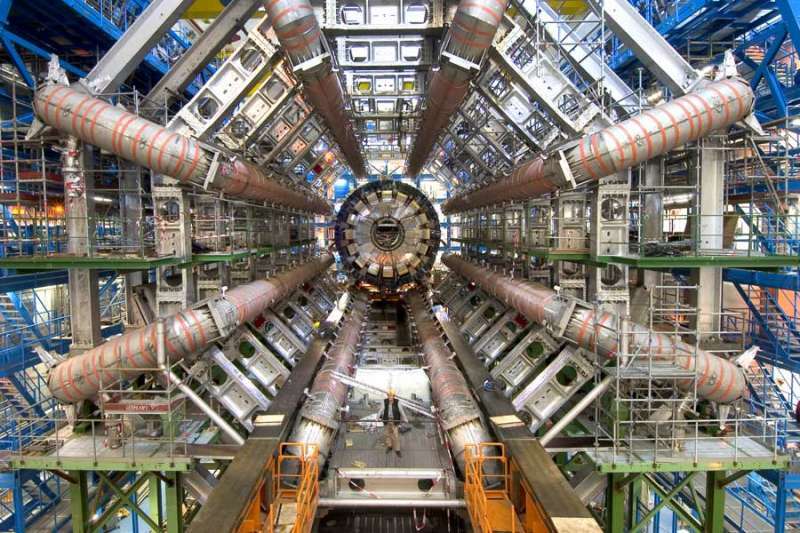 The collider will possibly produce the elusive “Higgs boson” sometimes referred to as the God Particle. The detection of which could explain how other fundamental particles gain mass and fill in some of the gaps in the “Standard Model” theory, or possibly even disprove it. Other theoretical particles have been predicted which might be created including “strangelets” and “miniature black holes” [MBH]. Strangelets are theorized to be a more stable form of nuclear matter composed of up, down and strange quarks, compared to normal nuclear matter composed of only up and down quarks. But some physicist thought that if strangelets exist and can be produced at the LHC, they could conceivably start an uncontrollable fusion reaction that would change all the matter on earth to strange matter, ending life as we know it. MBH’s are infinitesimally small particles of extremely high gravity. The rapid decay of the MBH would supposedly result in a sudden burst of particles as it explodes. Also on the agenda is a plan to hunt for signs of invisible dark matter and dark energy that make up more than 96 percent of the universe. The discovery of extra dimensions, which might validate sub-atomic string theory, is also on the slate. In short, physicists are trying to take a look back at the formation of the universe immediately after the “Big Bang”. But there are some who said there is a risk that the LHC might do quite a bit more than the physicists expect. Like create a black hole that swallows the earth or spit out sub-atomic particles that turn the planet into a lifeless rock spinning around the sun. CERN physicist John Ellis said that the LHC would only “reproduce what nature does every second, what it has been doing for billions of years.” CERN issued a safety report that said there is no “conceivable” danger. Some physicists seemed to have a little more imagination. Physicist Martin Rees, author of “Our Final Hour” said the chance of the accelerator producing a global catastrophe is one in 50 million. A chance of 1 in 50 million should assuage some fears, but what does that really mean? An investigation of the LHC website (http://public.web.cern.ch/public/en/LHC/LHC-en.html) gives a little mathematical cause for concern. To understand what this means you need to picture how the LHC operates. The collider tunnel contains two pipes, containing a vacuum, enclosed within numerous superconducting magnets cooled by liquid helium. A proton is beamed through one pipe in one direction and another proton is beamed through the second pipe in the opposite direction. They achieve near light speed and make 11,000 circuits every second. The magnets keep the protons positioned on course. Additional magnets are used to direct the beams to four intersection points where high-energy head-on collisions between them take place. When operating at full capacity, each particle carries a force of 7 TeV (trillion electron volts), now reaching a total in excess of 14 TeV at collision. These are the strongest subatomic collisions ever produced by man. Rather than continuous beams, the atomic nuclei would be “bunched” together into approximately 2,800 bunches, so that collisions between them would take place repeatedly at separate intervals. The intervals will start at 75 nanoseconds apart and eventually work their way down to 25 nanoseconds, which is meant to be the operating standard. A nanosecond is one billionth of a second. Simple arithmetic tell us that at a rate of one collision every 25 nanoseconds, that 50 million collisions occur every 1.25 seconds, and at 75 collisions every nanosecond it only takes 3.75 seconds. This seems suspiciously like the kind of statistical game the O.J. Simpson prosecutors tried to play with their DNA evidence. We all know the result of that. It seems that 1 in 50 million must refer to actual occurrence of the unveiling of the particle. But how often will that be? The amount of collected data gives us a hint. These experiments are expected to generate enough data to fill 100,000 CDs per second but only data that may show signs of the new physics will actually be recorded. That rate is expected to be enough data to fill 27 CDs per minute. This works out to .0000045 of all information being of interest. Can we infer from this, that .0000045 of all collisions will be of interest? If there is one collision every 25 nanoseconds, there are 40,000,000 collisions every second. That’s 180 collisions of interest every second, 10800 every minute, 648,000 every hour. That works out to 50 million collisions of interest every 77 hours, 9.6 seconds of operation. Could this mean that every 77 hours, 9.6 seconds of operation there could be a global catastrophe? Let’s hope not. Some physicists think there is a possibility of extra spatial dimensions in which it would be possible to create MBHs at a rate of one per second. If that’s the case we have 50 million seconds of operation or about a year and a half. British physicist Stephen Hawking does not see much to worry about. It was Hawking who provided the theoretical argument for the existence of radiation emitted from black holes. Hawking’s mathematics predict that MBHs emit radiation even faster than large black holes and therefore will “evaporate.” His predictions are mathematically based so perhaps we can take a breath of relief. Physicist and lawyer Walter L. Wagner didn’t take that breath. He claimed the safety report issued by CERN has several major flaws. He didn’t change his opinion and maintained there was a possibility that if an MBH is created, it may not evaporate as predicted but grow at an exponential rate. He said the risks outweighed the possible benefits and filed a suit in U.S. Federal court to stop the LHC from beginning operations. His suit was dismissed. So what are we, the human inhabitants of planet Earth supposed to do? Should we start counting our days, months and nanoseconds? Should we look at the upside and feel confident that this kind of pure scientific research can result in the discovery of new energy sources or as yet unconceived applications that could be of tremendous benefit to humanity? It has in the past, just look at what we’ve gotten from nuclear reactors, the A-bomb, the H-bomb, the neutron bomb and…. If history is our guide the mysteries of the universe will continue to be probed and poked as sub-atomic particles are smashed apart in the largest of all scientific machines ever conceived and built. It’s the results and applications we need to be concerned about. Answer: The last words spoken before the beginning of the universe.